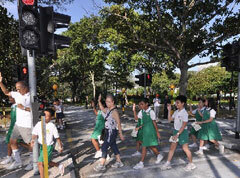 In November 2013, ten primary schools saw the LTA’s (Land Transport Authority) road safety initiatives. The Parliament Secretary for Transport visited the primary schools on January 3, 2014 to see the progress. Muhammad Faishal Ibrahim noted that motorists now are driving cautiously. There are many warning markings or signs when you approach a school zone. For instance, there are markings that warn you to slow down or reduce speed, etc. There is no reason if you get into accidents because you are properly warned. LTA has changed the speed limits outside the school. LTA implemented 40 km/h speed limit during school hours. This is to minimize speed-related accidents. Apart from the warning markings and lowering speed limits, LTA also placed more speed humps. There are people who would call it speed bumps. Speed humps are traffic calming devices designed to reduce the speed of a vehicle to improve safety. There are pedestrian barriers too. These barriers are effective in preventing pedestrians to cross dangerous areas. Barriers are especially put in critical areas. 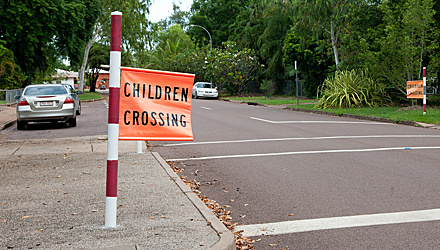 The safety of the children crossing the streets should be prioritized. LTA is on the right track. Now it is up to the children to follow the measures. Educators and parents should consistently remind the children to watch out when they cross the street and always consider the pedestrian whenever they cross.